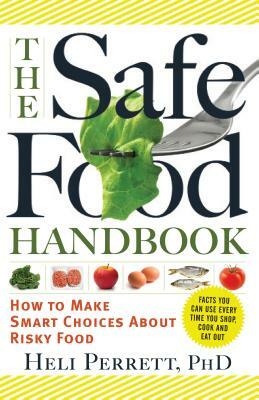 Helpfully organized by food group, The Safe Food Handbook demystifies the perils in our food—infectious bacteria, deadly molds, hormones, antibiotics, toxins, irradiation, and even wax on produce. Risks lurk in . . .
. . . but Dr. Perrett answers your questions on shopping (“What exactly does this label mean?”), eating out (“What should I avoid in restaurants?”), and food preparation and storage (“How long can I save these leftovers?”)—so you don’t have to worry. You’ll have the inside story on what’s really in your shopping bag—and on your fork. Heli Perrett, PhD, a sociologist and microbiologist, has served as a senior technical specialist at the United Nations Development Programme and at the World Bank. She specializes in food, public health, and farming issues. She learned to love and grow food at an early age, and she continues to harvest organic crops at her home in Oakland, California.